has been blocked by your system administrator. reached this page in error. Filter provided by Geek Rescue. Thank you for visiting Geeks to the Rescue online! ... or, you could just be a search engine. 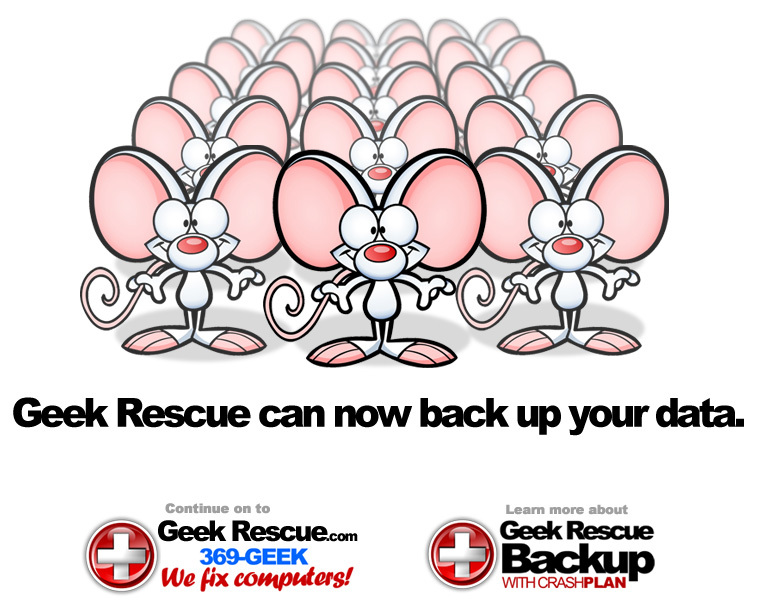 In either case... here's the information you're looking for: Geeks to the Rescue or Geek Rescue for short provides Interactive Marketing and Computer Support to homes, home offices and buisnesses 24 hours a day, 7 days a week. That's right we fix computers! We have two offices in Tulsa, Oklahoma. One downtown @ 15th & Denver and 61st & Memorial next to Friday's Restaurant. Recommendations on the most current drivers for the customer's hardware. Fixing problems related to malfunctions of MicrosoftÂ® WindowsÂ® Operating Systems and related applications. Here's some information on how we help people build web sites. Provide helpful information to prospects, browsers, etc. Why choose Electronic Billboards, Inc.? Commitment. Electronic Billboards is made up of a team of Unix and CGI programmers, Web designers, Marketing professionals, and of Account Executives, all working together to continue to provide our clients with the best Internet presence available. We are continually upgrading our software and hardware for our customers. Assurance. At Electronic Billboards, we do not require any long-term contracts. We are confident you will be 100% satisfied with our services, and if for any reason you are not, you can cancel your service at any time. Support. We have one of the most comprehensive and extensive support areas on the Net. Our sales/support staff is easily accessible via e-mail, fax and telephone everyday. As a customer of ours, we see to it that your questions do not go unanswered. We have developed a Customers Only area where you can get help 24 hours a day, 7 days a week. Technology. Web servers are incredibly powerful tools that can be used in a number of ways to benefit your organization. We have developed software that comes pre-installed on all our servers. It allows the users to take full advantage of the advanced features of these servers without requiring a background in programming or even computers. Electronic Billboards, Inc. home office is located in Tulsa, Oklahoma. Ranging from non-profit organizations to industry leaders, our clients have very different images, attitudes and goals. The sites include simple "graphical facelifts" of on-line versions of their brochures and/or complex sites using sophisticated database technologies. While the individual sites are very different, they all share common themes: Graphic impact, easy navigation and quick download times.